Into the early history of Methodism in Montana has been written the story of those pioneer preachers who followed the prospector, accompanied the covered wagon train and began preaching the gospel with the first establishment of community centers on the prairies, in the mountains, and in lumbering and mining camps. The first prospectors arriving on the present site of Butte were recorded in 1864. There were just a few cabins scattered along Silver Bow Creek in which lived a few placer miners who had come over from Alder Gulch to look for gold. There was not much to be found in the bed of the creek, but views of ore were found on the sides of the butte above and these proved more promising, and at some 20 feet or more down, the gold and silver veins turned to copper which proved to be the fabulous wealth of the hill. Into the early history of Methodism in Montana has been written the story of those pioneer preachers who followed the prospector, accompanied the covered wagon train and began preaching the gospel with the first establishment of community centers on the prairies, in the mountains, and in lumbering and mining camps. The first prospectors arriving on the present site of Butte were recorded in 1864. There were just a few cabins scattered along Silver Bow Creek in which lived a few placer miners who had come over from Alder Gulch to look for gold. There was not much to be found in the bed of the creek, but views of ore were found on the sides of the butte above and these proved more promising, and at some 20 feet or more down, the gold and silver veins turned to copper which proved to be the fabulous wealth of the hill. familiar with the mining camp as he was with the church, he came to the booming Butte area in early 1873 to lead worship and lay the groundwork for a new church. At this time he was also was traveling by horseback 160 away to serve the new church in Salmon City, Idaho. In 1875, Duncan, who had been sent to Missoula for a few years, was appointed to the new endeavor in Butte. The community began to grow as the mining prospects became more developed. It was said that Brother Van (William Wesley Van Orsdel), who had come to Montana in 1872 and would years later become "the most loved and respected man in Montana," preached in Butte at a service for which the entire population of the town was present. Since there were probably less than 50 people living in the vicinity then, the crowd wasn’t large. In 1876 the name of Butte first appears in the official minutes of the Rocky Mountain Conference. W.C Shippen was sent from Helena to Butte. He stayed only a year and the work was combined with Fish Creek in the Jefferson Valley 30 miles away and F.A Riggin was made pastor of the circuit. Riggin was one of the great stalwarts of early Methodism in Montana. Coming out west (from Pennsylvania) on advice from his doctor to improve his poor health, he ended up in Sheridan, Montana in summer of 1873. By the time he came to Butte in 1877 he was only 30 years old and had served a circuit that included Sheridan, Virginia City, Madison Valley, Fish Creek, Poindexter (Dillon), Bannack and Salmon City. Traveling this huge circuit (usually with Brother Van at his side) was a monumental undertaking. There were no parsonages and few church buildings and travel by horseback was constant. In 1876, while still having to maintain the Fish Creek circuit he was made presiding elder of the Helena District. That year the General Conference of the Methodist Episcopal Church granted permission for the formation of the Montana Annual Conference. Still residing in Fish Creek, Riggin was made the Presiding Elder of the new Butte District of the new Montana Conference. In the February 5th, 1890 edition of the Montana Advocate (the periodical of the Montana Methodists – which for decades was published out of Butte), Francis Asbury Riggin writes: "My first appoint to preach in Butte carried me over the main Divide of the Rocky Mountains on horseback 30 miles, in the Fall of 1877. When I arrived, there was no church nor parsonage to receive me. Nor was there any organized work. I put my horse in the livery stable and went to the hotel and registered. I hunted up a place to preach and was informed that the only suitable place was a dance hall owned by Judge Loeber. He told me that his rate for the use of the hall on Sunday was $5. This would not put it in condition and I must sweep it and light it and make the fires. This I was thankful to do. I had a good congregation. I paid the $5 out of my own pocket, I paid my bill at the livery stable for my horse, I paid my hotel bill; it all amounted to $10. I received no compensation." "I couldn’t stay long but I went to the townsite Co. plat and selected six lots for a church. These were the nearest vacant lots to Main Street. I agreed to pay for them when the deed was furnished. On my return I found that they were sold to another and conveyed. After preaching a few time with a similar experience as narrated above I found a stopping place at the home of Brother A.T. Rundel and sons, and others, and the hotel bill was wiped out but the livery bill and the hall bill went on. I made another attempt to purchase two lots, this time in the block where the Presbyterian Church now stands, having agreed on the price before the conveyance. Another offered better inducements and got the lots." "In the meantime our congregation steadily increased, filling frequently the spacious hall which would seat more people than any church edifice now in Butte. When the new school house was built we moved to that building, upstairs; we got its use by paying the same rent. As it paid Paul even if it robbed Peter, we felt glad to aid the school fund". These services in Butte were held in the old two-story "Central School" located in the center of the block where the Public Library used to be. The upper floor was used for all kinds of public purposes and on Sunday afternoon there was held a Union Sunday School. It was in the Union School that Mountain View Methodist Episcopal Church had its birth. F.A Riggin continues: "Our labors culminated in a gracious revival in the spring of 1878 in which I was aided by my colleague and brother, W.W. Van Orsdel. There were about 50 conversions. At this time we organized a church and a board of trustees. I obtained the promise of two lots where the church now stands, borrowed the money out of the bank of Clark & Larrabie on my own responsibility and paid for them. Their cost was $150. We took up a subscription for a church…The first church was built on these lots and later a parsonage." One of the ‘prominent Montana men’ to help build the Mountain View Church was Patrick Carney. He later became nationally famous for raising potatoes in the Jefferson Valley where he supplied "great big baked potatoes" on the dining cars of the Northern Pacific railway. He relates how the trustees of Mountain View faced a problem: "…the lots where the church now stands could be gotten for nothing and two blocks down the hill there were two other lots for sale for $300. They chose the free lots. The Baptists later bought the other lots; but as a result "successive generations of Methodists have had to toil two blocks further up the hill." This conflicts with Riggin’s version of his paying the $150 cost…Riggin probably kept his part confidential at the time and both versions make a great story! (For more on this story and for more details on F.A. Riggin, who died in 1924, consult Paul Adams’ wonderful "When Wagon Trails Were Dim".) This is the same Paul Adams who served at the pastor at Trinity Methodist Episcopal Church (see below) from 1912-1914. Early-day Presbyterian minister, J.R. Russell also relates that the four congregations that had shared the Union School (Episcopalians, Presbyterians, Methodist Episcopalians, and Southern Methodists) all used the new Mountain View facilities for a time. He relates that "it was only partially completed and muslin took the place of glass for windows." In 1887 the first annual session of the Montana Annual Conference was held at the Mountain View Methodist Episcopal Church, which was for many years the largest church in Montana Methodism. As early as 1895, there were 165 members in this congregation. The Women’s Foreign Missionary Society was organized in the church (later to become the Ladies Aid, then the NSN Club, then the Woman’s Society of Christian Service and finally the United Methodist Women). Dr. Phoebe A. Ferris, a member of Mountain View, went to India and later China as a medical missionary and the Mountain View women’s fellowship (by whatever names they went by over the years) continued supporting her missionary work until her retirement. She returned to Butte in the 1920’s to run the Deaconess Hospital (see below). In 1899 Governor Rickards reported that "Methodism was never so prosperous nor more promising than now." The present Mountain View Church structure building was begun in 1898. During the building of it services were held in the courthouse and congregations of 1000-1200 were not uncommon. On February 25, 1900, just 2 days less than a year after it was decided to build, the first worship service was held in the new, beautiful, conveniently arranged and elegantly furnished church. The total cost of the church, complete with organ, stained glass windows, carpeting, seats, and so forth, was $25,000. The cornerstone laying was quite an event, with Senator Clark, Ex-governor Rickards, and the ‘most beloved person in Montana’ Brother Van (Rev. Wm. Wesley Van Orsdel) all giving speeches from a platform adorned with freshly cut pine trees and an American Flag flying twenty feet above the crowd. The grand gothic style was probably designed by Butte architects Link and Donovan and the complex geometrical and floral designs of the stained glass windows suggests that they were built by the then flourishing Butte Art Glass Works. Copper King and later U.S. Senator, W.A. Clark was then the president of the church’s board of Trustees and Butte's first mayor, Henry Jacobs, was also a Trustee. In the early 1940's the windows flanking the organ were given as memorials and constructed by the J.&R. Lamb Studios of New York (still in operation). There is a newer central window in the south wall of the church. This replacement came about as the result of vandalism and theft in the 1990's. Renowned local stained glass artist Tim Cox of Alder (now living in Kentucky) built it. Mountain View also holds one of the most spectacular organs in the Pacific Northwest, installed by Kilgen Co. at a cost of $12,000 in 1949. Grace Methodist Episcopal Church of South Butte was begun in fall of 1879 and was first know as the "South Butte and Meaderville mission." Those on the official board were Bros. Van Orsdel, F.A. Riggin, and ex-governor Rickards. In 1886 the site of the church, on Arizona and East Second Streets, was purchased by Rev. F.A. Riggin and Rev William E. King. The first pastor, W.F. Hawk, was appointed in 1888 and the building’s cornerstone was laid on April 11, 1889. Up until 1899, Grace and the Unity Church (see below) were one charge. That August Grace became a separate charge and the church grew rapidly. More room and facilities soon became necessary and in 1902 the building was enlarged and remodeled. At various times over the ensuing years Grace Church shared its pastor with Silver Bow, Wesley Chapel, Unity and, later, St. Paul’s churches. In 1939 the Silver Bow Park Methodist Church consolidated with Grace and the name was changed to Grace-Silver Bow Methodist Church. In 1941 the parsonage on Arizona Street (north of the church) was remodeled for use as a Sunday School and named Freeman Hall. It was Grace-Silver Bow Church that assumed the leadership of building of a new church on the flats…what was to become Aldersgate UMC. More lots were purchased in the area of Thornton and Grand Avenue (where the Silver Bow Church had moved in 1919 –see below) and a Fellowship hall was completed. In 1960 the Grace Church building was sold to the Church of God denomination and the monies were used in the debt retirement of the Aldersgate Church and parsonage. It now (2007) stands empty, with part of the building used recently (?) as a residence. In 1883 Mount Bethel Methodist Episcopal Church was started in Walkerville on Clark Street. George C. Stull was appointed but moved to Mountain View the next year. J.W. Bennett then was appointed and he built a church and parsonage and served other points in the Butte circuit. In 1906 the church moved to Main Street where the Anaconda Mining Company donated them property. During the later years of its existence the church shared pastors with Centerville, Silver Bow Park, Wesley Chapel and the Unity Church in Meaderville. In the early 1920’s the basement was converted into a social hall where many bazaars and entertainments were presented. In 1961, Helen A. Handlin went from the church as a missionary nurse to Mexico. The last Sunday School Christmas Program was held in 1970. The building was then used as a youth center until 1972 when it was sold. It is currently (2007) being used as a manufacturing facility for fireplace hearths. Trinity United Methodist Church was organized as the Centerville Methodist Episcopal Church North in 1884 in a rented building on the corner of East Center Street and Wells Street, where Reverend J.W. Bennet gathered a group of 25 young people for Sunday School. They had been meeting for some years in the school house before Rev. Bennet was appointed to develop the new church (less than a half-mile down the hill from Mt. Bethel). During a lively Christmas program in 1886, the floor collapsed and members decided it was time to build a church. In 1887, the present site on the corner of LaPlatte and Main Street was donated by the Butte & Boston Mining Company and construction began. Rev. Joel Vigus came in 1889 and found only one member and worship attendance averaged 8 persons. The church building was begun anew and dedicated that very Christmas in 1889. Gary Treglown, the newly appointed pastor to Mountain View ~ Trinity UMC (2007) who is himself a Butte native, tells about his grandfather, who had helped build the new church, not being allowed in for the Dedication Service. It seems he had just gotten off his shift in the mines and was not wearing either a coat or a tie and, therefore, was not allowed in the building. In a fit of unchristian anger, he lit a stick of dynamite in the street in front of the church; and, besides getting everyone’s attention, blew out the church’s windows. The new building included something quite remarkable for the early 1890's: electric lights, donated by Senator Lee Mantle. (An Englishman, Mantle served in the Montana Territory House of Representatives, had been mayor of Butte and was a US Senator from 1895-1899. He established the Daily Inter-Mountain newspaper in Butte.) In 1896-7, the original wood-frame building was raised up and a basement built to accommodate the fellowship hall. It was given a brick veneer and a vestibule and choir rooms were added. As more time went by, an organ was purchased, a furnace replaced stoves, and memorial windows were dedicated to those who helped to place the Church on the hill. When Rev. Vigus left in 1891, the church was debt free; there were 200 members, 175 listed in the Sunday School and 23 recorded in the choir. Situated at the border of two working class communities (Centerville and Walkerville), Trinity church was known as one of the "miner's churches," as opposed to the "Mine Owner's churches" and it especially served early Cornish miners. Walkerville was named for the Walker Brothers, owners of the first mine in Butte, the Alice silver mine in the north part of town. As many as 60 mines operated in or near Walkerville alone. Although Walkerville was dominated by miners of Cornish extraction and their families, the neighborhood was considered more cosmopolitan than Butte, down the hill. Centerville (on the east side of Trinity UMC) was home to comparable numbers of Cornish and Irish residents. Stores and businesses, from the grocery to the barber shop, had two of each kind...one for the Cornish and one for the Irish. Trinity, as aforementioned, was erected by and for the Cornish residents. It was recorded that during World War II 78 men and women from Trinity enteredthe service and 76 of them returned. In 1926 some of the younger ladies of the adult Sunday School class decided to organize a club for the ‘young adults.’ They called themselves the H.U. Club. H.U. stands for ‘Higher Up’ which not only reflected the altitude of the church compared to the rest of the Butte environs, but also their intention through community service and study to go and grow ‘Higher Up’ as followers of Christ. The watchword that summarizes their high ideals was ‘Service to Go, to the Church, and to the Community.’ The group is decidedly older now but it stills exists with the same goals and aspirations. Unity Methodist Episcopal Church was begun in 1887 by a half-dozen people meeting in a room over a saloon in Meaderville. In 1889 the church was built on Meaderville’s Main Street and it was enlarged in 1896. 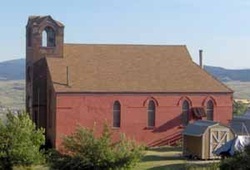 The mining industry encroached on the church building and in 1906 construction was begun on lots donated by the Boston and Montana Mining Company, still on Main Street but east of Silver Bow Creek, between the communities of Meaderville and McQueen, across from the Franklin School. The cornerstone was laid on August 19, 1907 by the Montana Grand Lodge of A.F and A.M. and the Montana State Band played and the Men’s Glee Club sang. Unity Church became a part of the Grace Charge in 1937 and Aldersgate in 1959. Once again, in line with the industrial advances in the neighborhood (the growth of the Berkley Pit) it became necessary to sell the building to the Anaconda Company and the final church service was held on March 15, 1964. The organ and the pews were taken to the Lake County Community Church in Ronan and the proceeds from the sale of the church, $15,000, were used for the building of the Aldersgate parsonage on Kossuth Street. Silver Bow Chapel was a part of the Butte Mission during the 1890’s and the first building was known as St. George Church, located on the northeast corner of Silver Bow Avenue and Adams Street. They shared pastors with Walkerville and the Wesley Chapel. In 1919 three lots were purchased on Grand Avenue and the church was moved there, facing Thornton Avenue, in 1921. A kitchen was added and the church grew and the Sunday School gradually outgrew the building. In the 1920’ and 30’s they were a part of the Unity charge and in 1939 it became part of the Aldersgate Church. Later that year the building was sold to the Bible Baptist Church for $180 and moved to Hannibal Street. They later tore it down and rebuilt. Wesley Chapel was begun in 1897 as a mission Sabbath School at Parrot Flat. It was know as the East Side Mission until 1900 when the name was changed to Wesley Chapel. In 1911 a facility was built at 1000 Talbot Avenue (later Mercury Street) and it shared a pastor with Mt. Bethel until 1916, when it became a part of the Grace Charge and was served mainly by local church lay preachers. T.H. Rhodda, one of the large group of Lay Pastors licensed in Butte in 1916 (see below), served here for the next 16 years. In 1938 the Pentecostal Church rented the building and later bought it. With the expanding development of the ‘Pit,’ like Unity Church the year before, it was sold to the Anaconda Company in 1965. With the proceeds from the sale and the salvage of the building, the Pentecostals bought the St. Paul’s Methodist Church on Lowell Avenue (see below). In 1916 an Italian Methodist Mission was established near Silver Bow Creek in Meaderville (again, on land donated by the Anaconda Company) and was served by three consecutive Italian pastors. The building of the St. Helena’s Roman Catholic Church drew the Italian population of Meaderville and McQueen away from the Mission and the land and building were returned to the Anaconda Company which in turn gave it to the Butte Mines Band. At the corner of Platinum and Idaho Streets was an African Methodist Episcopal Church (AME) called the Shaffer Chapel. The building (and the interior carpeting and chairs were a gift from W.A. Clark to the black population of Butte in 1901. 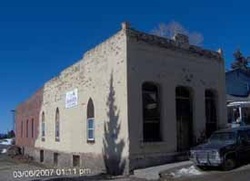 The building was later used by the Church of God Prophecy and is currently (2007) vacant and for sale. Wesleyan Methodist Church, at the corner of Gaylord and Galena Streets…don’t know when it began or when it ceased service, but have a brochure with the address and pastor…Like the other churches, businesses, and homes in the Meaderville area that went into the ‘Pit,’ the building was probably torn down in the 60’s. Mountain View Methodist was known as the 'Mine Owners church.' (Trinity, up the hill at Centerville, and Mt. Bethel, up the hill at Walkerville, were know as the 'miner's churches.) Methodists from Cornwall, England played a prominent part of Montana Methodism. It was estimated that in 1910 there were 5000 Cornish living in Butte and they made up the larger part of the Methodist congregations (close to 100% of Trinity and Mt. Bethel). They brought their ‘old country’ habits and traditions with them and all the Butte congregations were duly famous for both their singing and their dinners. In 1916 there were more Methodists and Methodist churches in Butte than there were Catholics (believe it or not! ); and 15 people were licensed as lay pastors to assist with the burgeoning ministry… W.H. Berryman, John Boyle, WT. Harris, Lee Hayes, Alfred Hester, Frederick Kean, E.H. Luckenbill, R.W. Nicholls, William Nichols, J.B. Penhall, F.C. Reicherts, T.H. Rhodda, W.H. Rundle, C.J. Saunders, Will Thomas, and William J. Vigus. During the these heydays of Butte in the 1920’s, Mountain View had church school enrollments of over 600 children and the other churches in the city also overflowed with children and youth. Facilities and pastors and staff were overworked with the busy activities of worship, Christian education, mission to the poorer elements of the community, and support for far-flung world missions. Butte was literally the "richest hill on earth" and Butte residents (almost 100,000 strong) boasted the highest per-capita income of any city on earth (the standard miner's wage had been raised to over $3.75 a day). There were 11 Methodist churches and a brand new Deaconess Hospital. Mountain View Methodist Episcopal Church was the 'cathedral church' of Methodism in the Rocky Mountain west; and, with its ten sister churches, served many thousands more people in mission than their membership would reflect. But, as wonderful as that sounds, Butte was a difficult and unique place in which to live and to minister the Gospel. A mile high and surrounded in a rather unique cul-de-sac of the continental divide and surrounded by majestic mountains, Butte, itself has never been considered ‘pretty.’ It all has to do with the mining…In his 2006 book about the North Butte Mining disaster of 1917, Fire and Brimstone, the worst underground mining disaster in the history of the United States, author Michael Punke writes, "When a Butte miner walked to work, he traversed one of the most god-awful ugly cities in America. Which is not to say there was no beauty in Butte. There was, but it lay deep below the surface. For its citizens, the town’s ugliness was practically a point of pride. Butte, they understood, was first and foremost a mining camp…The wealth of the copper industry brought Butte Victorian mansions, six-story department stores, plush theatres, and a hilltop college overlooking the town like a Butte version of a Greek temple. Yet interspersed among Butte’s fine buildings was the cruder architecture of the mines. Dozens of gallows headframes marked the top of mine shafts dropping half a mile into the earth. Elegant buildings stood next to forty-foot piles of slag. Railroad tracks connected every mine to the nearby smelters; with trains shuttling through town around the clock…Smoke from the smelters…was so thick that streetlamps were sometimes kept illuminated during the day. The smoke, loaded with arsenic, killed every tree—every tree, and every blade of grass. Except on St. Patrick’s Day, Butte was devoid of green…Even the blind knew that Butte was ugly, because in addition to arsenic the smelter smoke was laden with sulfur, also know by its more biblical name of brimstone. Butte, literally, smelled like hell." The richest men in the world at the time, copper barons William Clark, John Daly, Fritz August Heinz lived side by side with penniless immigrants from all over the globe. Churches lined the sides of Montana Avenue and brothels sprawled a few blocks east near Main Street. Every day for decades, unnamed immigrants got off the train in Butte to work the mines (which often turned over 40% of its work force each week and in which there was usually at least one fatality each week). It was at the same time the most cosmopolitan and the most segregated city in the world. Warning signs at the mines were written in 16 different languages. On any given Sunday morning, while a thousand people worshipped in uptown Butte alone, a thousand prostitutes would be working the ‘cribs’ in the red-light district, and a thousand miners could be served at one time in the Atlantic Bar alone. While 163 bodies were being removed from the Granite Mountain and Speculator mines in June of 1917, Al Jolson and his 208-member cast were in Butte to perform the "original New York Winter Garden production" of Robison Crusoe. Thousands of people would flock to play at the Columbia Gardens, an amusement park and horse racing track built by Wm Clark for the people of Butte, which rivaled any other such facility in the world, on the week-ends while thousands of men would fill the streets downtown in a series of labor strikes and riots that shut down the mines and brought in the National Guard and martial law. It was in this remarkable town that Methodist Christians (alongside their brothers and sisters of other denominations and faiths) would minister to the spiritual and emotional and physical needs of the "Richest Hill on Earth." For decades Butte was also the home and headquarters of area District Superintendents. Such faithful and honored leaders as Francis A. Riggin, Jacob Mills, Robert M. Craven, Edward Smith, Edward Mills, Charles Bovard, and Hollace Holtzinger made Butte their home and headquarters. Many other Butte pastors have gone on to become Superintendents in other areas of the Conference: Paul Adams, Roger Robison, Charles Nowlen Jr., Lyle Hamilton, and Gayle Sandholm, and Su DeBree (currently serving the Western Mountains District and living in Helena) to name just a few. Many Butte youth became pastors in our Conference: Bob Craver served at Aldersgate, then later for the Greater Butte Parish, and finally at Mountain View/Trinity. Gary Treglown has been in Billings for many years and has just been appointed to served at Mountain View/Trinity beginning in July of 2007, William Mullette-Bauer is currently serving as the Director of Connectional Ministries of the Yellowstone Conference and lives in Helena, and Sandy Peterson Storment (who years ago had been the church secretary for Aldersgate) is the pastor at Grace UMC in Billings. In recent years, others serving as Lay Leaders of Mountain View ~ Trinity UMC have gone on in service of local churches as local pastors: Jack Preston is serving in Basin and Hyattville, Wyoming and Richard Rice, who serve two years at Mountain View/Trinity, is currently serving in Havre, Montana). 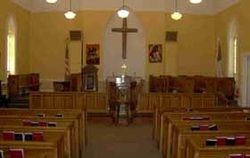 By the 1960’s the prospects of Butte Methodism had declined as the mining industry and the population declined. Earlier in 1952, five churches (Grace, Unity, Silver Bow Park, St. Paul's and Wesley Chapel) recognized the need to plan for a new church to serve the growing areas to the south of Butte and incorporated as the Methodist Church Extension Association of Silver Bow County. (the idea of such a consolidation had been considered as early as 1925 and would have been known as the Butte City Parish of the Methodist Episcopal Church, but the idea was not acted upon until the ‘50s). In 1954 property was acquired at Grand and Thornton Avenues for the site of the new church and a formal merger took place in April of 1958. Ground-breaking ceremonies for a newFellowship Hall of the new Aldersgate Methodist Church took place a few weeks later. The present sanctuary was begun in the summer of 1963 and the first services were held in February of 1964. Much of the construction was done with volunteer labor and Mr. and Mrs. W.B. Hall (owners of the former Hall Lumber Company) were so generous that the Chapel was named in their honor. The Chapel has altar furniture from the original Grace Methodist Church and the chancel equipment in the sanctuary was given in memory of Mrs. B.K. Wheeler, wife of Montana’s former Federal Attorney General, U.S. Senator, and (until Mike Mansfield came along), the most nationally influential and well-known Montana citizen. In 1964 Mountain View purchased property on the corner of Montana and Centennial with the vision of building a new Mountain View Church. But fortunes changed and the plans were shelved and the property re-sold. In September of 1965 the four remaining churches (Mountain View, Trinity, Mt. Bethel, and Aldersgate) laid plans for and approved a larger combined parish; and on April 17, 1966 a resolution embodying all suggestions and recommendations on the establishment of the Butte Methodist Larger Parish was accepted by vote at the Quarterly Conference of each church involved. Membership was officially opened on September 1, 1966. A team of three pastors were assigned to serve the Butte Methodist Larger Parish. In 1967, one of the pastors, John Pugh, was instrumental in starting regular Radio broadcasts of the Mountain View worship services on KBOW 550AM radio. At that time Mountain View was chosen to host the radio broadcasts because it not only had the magnificent Kilgan pipe organ, but it also had the largest choir of any of the other Larger Parish churches. The radio broadcast continues to this day, 40 years later, as an important part of the ministry of the Mountain View ~ Trinity UM Church. Mt. Bethel merged with Trinity in 1970 and only two pastors were serving the Larger Parish. Worship Services were held at Trinity, Mountain View, and Aldersgate Churches, with church schools organized at Mountain View and Aldersgate, and youth groups, women’s groups, prayers groups, and study groups functioning mainly at Aldersgate. It didn’t take too long for problems to arise. Problems of financing projects and maintaining buildings in three areas caused some dissension. Also, ministers who found it a strain to provide services and minister to the needs of three congregations accepted other assignments causing the Larger Parish to have frequent changes in leadership. At a congregational meeting in the fall of 1980 a majority of the people, seeking a lack of growth in the churches, voted to dissolve the Larger Parish. On January 1, 1981 Aldersgate United Methodist Church was on its own again and continues to this day to serve Butte in the newer 'flats' portions of town. Mountain View and Trinity churches formed one congregation with two facilities and continue to serve the uptown and 'up-the-hill' portions of old Butte. In reality, both churches draw members from all over Silver Bow County. The Social Development Center is a service sponsored by the Mountain View -Trinity UMParish. It is interdenominational and accepts individuals of all faiths. The Center provides training and social opportunities in a supportive and caring atmosphere for adults with development disabilities in Silver Bow County, so they may express themselves, make choices, fulfill dreams and grow in knowledge, acceptance and understanding of them selves and others. Mountain View Social Development Center provides day program services to individuals with developmental disabilities who are over 55 years of age or function in a fashion to those who are over 55 years of age with reduced capacity for work productivity. Other community services in addition to senior services that are available through a referral process include: group home placement, supported living, day services, and supported employment. The Center serves both men and women that live in a variety of housing situations including nursing homes, foster homes, group homes and with family. Usually over 20 persons participate in the program, which runs five days a week year round. The program is primarily funded through the Montana State Department of Health and Human Services~Developmental Disabilities Program, the United Way of Silver Bow County and individual donations. We are staffed by trained professionals. Church members serve on the board and volunteer or visit. 2. To help each individual to become as self sufficient and independent as possible in his/her environment. 3. To maintain and improve quality of life by providing social interaction, cognitive training and having a variety of activities available for choice making. 4. To assure a healthy, creative and safe environment for those who attend the Center. Entrance Requirements...Individuals are approved by a Screening Committee after meeting the State of Montana eligibility requirements. The Committee consists of representatives from the Department of Public Health and Human Services ~ Developmental Disabilities Program, B.S.W., H.I. Case Management, Mountain View Social Development Center and Silver Bow County Developmental Disabilities Council. Activities...The Center is a retirement type setting where the focus is on leisure and recreational activities. Activities may include but are not limited to: board games, Bingo, music, embroidery, arts & crafts, caring for Center pets, bowling, movies, picnics, shopping, exercising and field trips. Life is different for the folks at the Center than it is for most of us, but it is still good! Paul Adams’ "When Wagon Trails Were Dim" and Edward Mills "Plains, Peaks and Pioneers" (both of whom have serve Butte parishes and lived in Butte while serving as District Superintendents) tell mores stories about such Butte old timers as Jacob Mills, Governor Rickards, F.A. Riggen and Brother Van (and others); and Doris Whithorn’s "Bicentennial Tapestry of the Yellowstone Conference" provides intriguing details about where pastors and persons served, both before and after their time in Butte (and other interesting details… i.e. regarding James E. Coad who served at Unity and Silver Bow…"became involved in trouble and left suddenly for parts unknown…" Or again; about Charles G. Cole who served at the Pastor at Mountain View from 1926 to 1932. 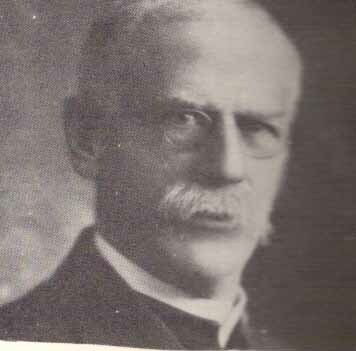 He then became superintendent of the Helena District and in 1934 was also the pastor the Unity M.E. Church in Butte. He went on to serve as District Superintendent for 4 different districts…"He was a man of the people, as common as an old shoe, and fit just as well…people loved him for he could sympathize with them in the Depression, knowing that much church giving was stained with blood, sweat, and tears." The local church histories from Mountain View, Trinity, and Aldersgate, which were used for this more encompassing history of Methodism in Butte (see the Bibliography), share stories and details of some especially beloved church school teacher, organist or pastor; and give some obscure details and dates to when parsonages were built, carpeting laid, and furnaces installed (and many other little ‘factoids’). Even if I added all those stories to this brief general history it would not be a true history of Methodist Churches in Butte…the most important information has been left out. The true history should be about the tens of thousands of lives that were changed and influenced for the better from the sermons and bible classes of hard-working, under-paid, and over-stressed clergy. The true history should be about the multitude of children and young adults whose lives were formed and whose faith was instilled by the hundreds of long-serving church school teachers and youth group leaders. The true history would tell about the ministries of these several churches that provided food and shelter for countless poor and unnumbered itinerants. The true history should tell of those persons needing care for their souls and bodies whether in hospitals, or brothels, or the shanties. Some of the smaller churches listed here were missions and the larger churches mentioned here supported missionaries overseas…their stories are not told with near the detail or attention they truly deserve. The true history of these churches would tell about the women’s groups’ studies and mission support that truly changed lives both in Butte and around the world. The true history should have all the stories of all the incidents of the men’s and couple’s gatherings that not only brought fun and fellowship into lives of so many but also strove for the betterment of all persons living in our community. The true story of the "Richest Hill on Earth" should be about those hundreds of thousands of people whose lived here over the past 133+ years and through their worshipping and ministering through these Methodist Churches changed and enriched the lives of not only themselves but also of the community and of the world in which they lived. Now wouldn’t that be a wonderful history? At the beginning of the 20th century Butte was becoming one of the richest, most diverse, and dynamic communities in the United States and in the world…now as we move into the 21st century Butte has both remained the same and changed drastically. A century later the largest cities in Montana are still not as large as Butte was a century ago and Butte, with a current population of about 34,000, while still the 6th largest metro area in the state (and 4th largest city), is a shadow of it’s former size and influence. A century ago Butte Methodists could barely keep up with the needed growth in ministry and mission to our home. Churches and ministry outreaches were popping up everywhere and families and children overflowed the spaces we had. Today most of those churches and ministries are gone and, like many main-line churches, we struggle to keep families and children involved and minister mainly to an older congregation with increasing needs of ministry to shut-ins and senior care facilities. Rather than worry about overflowing crowds, we stress over mostly empty pews and radically different faith and spirituality expectations of the older generation and the younger generation. Yet as we grow into the 21st century, Butte is growing again and there is a renewed enthusiasm for ministry and a continuing desire for a faith that is relevant to our lives. Aldersgate and Mountain View~Trinity are beginning to share ministries and are sitting down to talk with each other about how to not only survive but to grow and thrive as Christians offering the uniquely open and welcoming traditions of United Methodism. The United Methodist Church in Butte has certainly experienced "the best of times and the worst of times" during the 20th century and as we move through the 21st century we anticipate that we will continue to serve faithfully the changing needs and aspirations of Christian ministry and mission for our community and denomination. "The Vision of the Church"; unsigned monograph prepared for the centennial celebration of the Mountain View UMC facility in 1998.